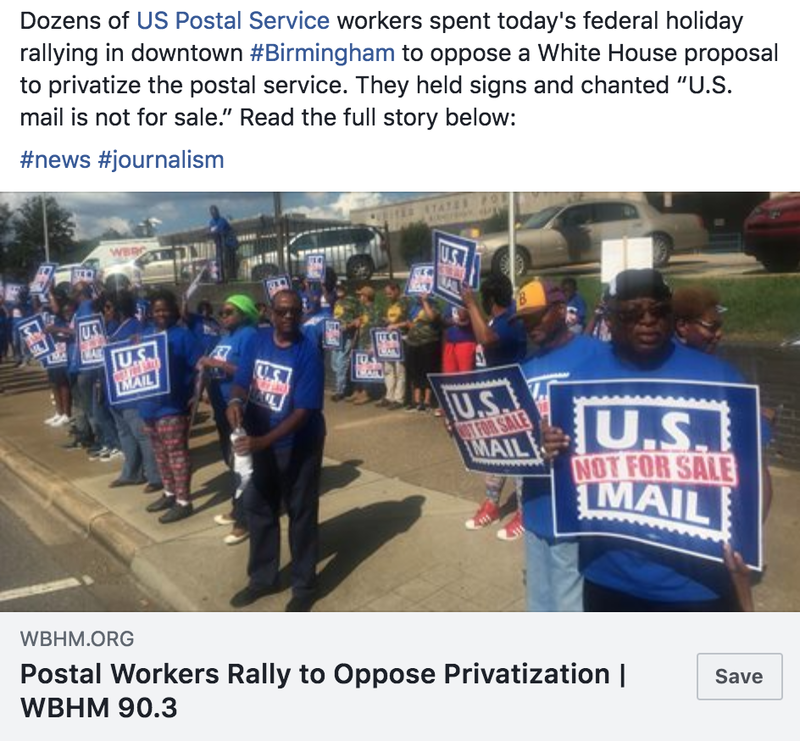 Monday postal service workers in Birmingham and in four other cities in Alabama joined others in cities all across the nation to protest privatizing the U.S. Postal Service (USPS). The rallies were coordinated through the American Postal Workers Union (APWU), a branch of the AFL-CIO. This idea of privatization is not new, nor is the debts and woes of the postal service. President George W. Bush set up a commission which issued a report in July 2003 that essentially said the future looked quite bleak and without major changes (most of which haven’t happened) it was unsustainable in a digital world. While currently the USPS does not take taxpayer funding (at the moment) their retirement debt alone is not sustainable given the continued losses that they face. For every dollar that will eventually have to be subsidize could go to something else: education, health care, I don’t know, how about the novel idea of just letting taxpayers have more of their own money to keep rather than subsidizing failed programs. Large unfunded liabilities for postal retiree health and pension benefits— which were $73.4 billion at the end of fiscal year 2016—may ultimately place taxpayers, USPS employees, retirees and their beneficiaries, and USPS itself at risk. As we have previously reported, funded benefits protect the future viability of an enterprise such as USPS by not saddling it with bills after employees have retired.22 Further, since USPS retirees participate in the same health and pension benefit programs as other federal retirees, if USPS ultimately does not adequately fund these benefits and if Congress wants these benefits to be maintained at current levels, funding from the U.S. Treasury, and hence the taxpayer, would be needed to continue the benefit levels. According to USPS’s testimony last year, “absent fundamental legislative reform, we face the prospect of having to continue to default on these prefunding payments [for retiree health benefits]in order to continue paying our employees and suppliers and to provide postal services to the American public. This increases the risk that taxpayers may ultimately be called on to fund these benefits.”23Alternatively, unfunded benefits could lead to pressure for reductions in benefits or in pay. Thus, the timely funding of benefits protects USPS employees, retirees and their beneficiaries, taxpayers, and the USPS enterprise. Where we have private mail delivery services like Fed-Ex and UPS that both cost taxpayers nothing the USPS is a federal program that in its current form and size time may have passed. It is past time for the government to get out of the business of losing money by running a failed business experiment — the private sector has proven it can do the same thing much more successfully. It’s time for people to look for and understand there are opportunities to save taxpayers money, and to reinvest more wisely where we do spend our dollars. This is one of them.